UNITED STATES SLAVE TRADE. 1830. 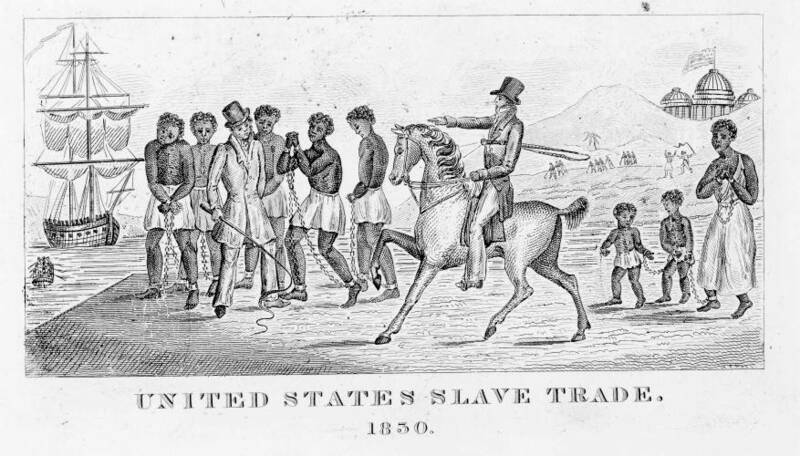 "UNITED STATES' SLAVE TRADE, 1830. The Copper Plate from which the above picture has just been engraved, was found many years ago by workmen engaged in removing the ruins of Anti-Slavery Hall, in Philadelphia, which was burned by a mob in 1838. No previous impression of the Plate is known to its present owner. A scene in the inter-State Slave trade is represented." The writer goes on to describe the scene as a group of slaves in chains, with a mother "fastened to her children," being sold by a trader on horseback to another. "Both dealers have whips in their hands. A ship and a boat, each loaded with slaves, are seen on the left. In the background, slaves are working in gangs, and one man is being flogged. The United States Capitol, surmounted by its flag, overlooks the scene in the distance. The engraving....is an interesting contribution to American History. Price 20 cents." The author suggests that this impression was printed some years after 1838. The author's use of "engraved" is evidently being a misnomer for "printed," since he mentions later in the same text the absence of earlier impression.